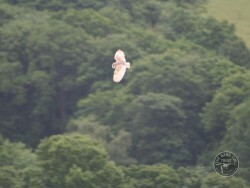 For every £1 you donate, 86p goes directly towards Barn Owl conservation. The other 14p helps us to run the charity and to raise the next £1. 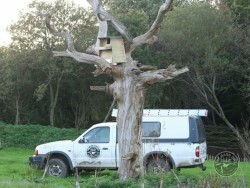 We spend 58p from every £1 on practical conservation work such as making and erecting nestboxes, caring for casualty owls and training ecologists. Our free national information and advice service uses 28p . Support costs are 5p and include running vehicles, paying phone bills, insurance etc.. Our Management costs are just 3p and include accountancy and end of year ‘independent examination’. We are always pleased to hear from individuals or businesses that would like to support our work. Please contact us. Ways to support our work. 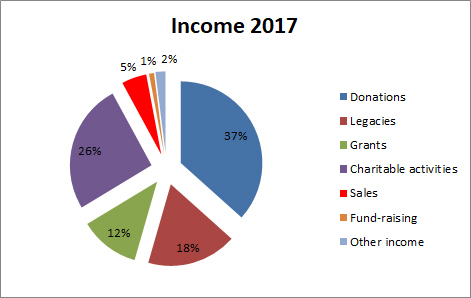 The chart below shows how our income was made up in the financial year ended 31st March 2017. 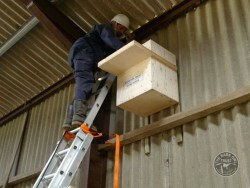 ‘Charitable activities’ includes the sale of nestboxes and income from our training courses ‘Other income’ includes bank interest and solar energy generation. Legacies accounted for 18% of our income in the year and grants 12%. You can view full copies of our accounts from 2012 onward on the Charity Commission website. The chart below for the same period shows that we spent 86% of our expenditure on Conserving the Barn Owl and its Environment. 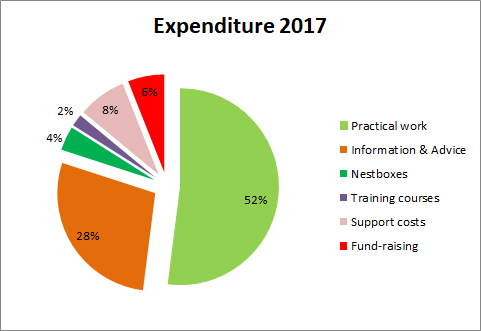 52% went on practical conservation, 28% on running our free national information and advice service, 4% was the cost of building nestboxes and 2% on running our training courses. Our Support costs made all of these things possible – 8% of total spend covered the costs of running vehicles, telephones, electricity, insurances etc. 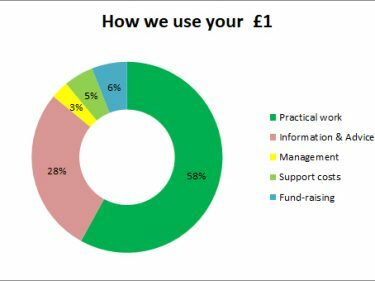 We spent 3% of Support costs on management of the charity, enabling us to fulfill our legal obligations; accountancy, financial inspection etc. Fund-raising, publicity and purchase of sales goods accounted for 6% of expenditure. We are able to keep these figures low because we have a wonderful team of volunteers. 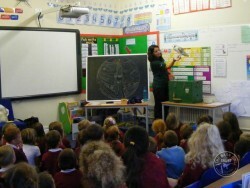 The Barn Owl Trust became a registered charity in 1988 and we published our first accounts in 1989. The Trust has grown in response to the need for the services we provide – practical conservation, education, information and research. We also own and manage 26 acres of land for wildlife The Lennon Legacy Project and have a small owl sanctuary and owl hospital. This growth has been made possible by the donations and other income we receive with the support of grants for specific projects and legacies. 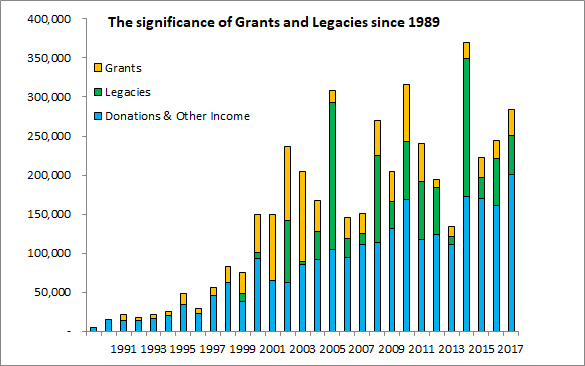 The chart below shows our annual income and the significance of grants and legacy income since 1989. We have 12 staff (4 full-time and 8 part-time) but we don’t have a fund-raising team. The general economic situation over the last few years has seriously affected us. Grant giving trusts have less money available and more applications. Like most other charities the grant income we receive has dropped. The chart above shows our income and expenditure since 2000 and the difference between the two. You can see that since 2004 we have ended several years with a deficit. We’ve been able to weather these periods (when expenditure exceeded income) thanks to legacy income. However our reserves were severely depleted following two years of deficit (-£99,674 in the 2012 -2013 financial year). To ensure we can continue operating at our current level we need to become less dependent on legacies and increase our regular support, donations and fund-raising. We need more Friends! Making a donation to support our work or a specific project. Becoming a Friend of the Trust and making a regular annual or monthly donation. Giving an Owl Aid gift. 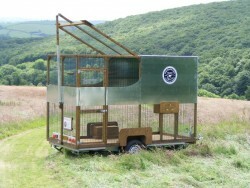 Considering a bequest to Barn Owls in your will. Buying from our ‘green’ Shop. Checking our “Do you have something we need” page. Holding a fund-raising event – email the office with your ideas. 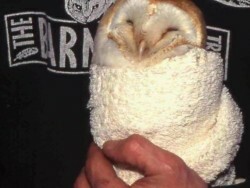 Thank you for supporting Barn Owls.